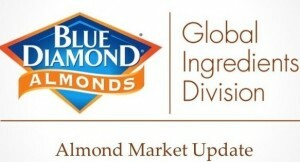 The Almond Board of California released the May Position Report on Friday June 10. Shipments for May were a record 178.1 million lbs, 28% higher than the prior year. Since January, export shipments from California total 549 million lbs, higher than in any prior year. All export regions are experiencing vigorous demand since prices have reset to levels last seen in 2012 & early 2013. U.S. almond shipments were also up a modest 2%, as retail almond prices are slowly beginning to reflect the correction in almond prices that began last fall. This is only the second month since October that U.S. shipments exceeded the prior year’s total. With the strong demand since January, ending inventory projects to ~450 million lbs, reduced considerably from the outlook in December. Forward commitments increased by 107 million lbs in May, and are 30 million lbs greater than same time last year. Uncommitted inventory is 83 million lbs greater than last May, but significant tightness has already appeared for specific varieties and CPOs into new crop. With the NASS Subjective Estimate of 2.0 billion lbs and expectations of a crop closer to 2.1 billion lbs, supply and demand appear more balanced heading into 2016 crop than in the past 3-4 years. 2016 crop demand for California almonds should be the largest in history, as an ample supply is intersecting with early prices that provide profit opportunities throughout the supply chain. A 5-6% increase over 2013 crop demand would keep inventory levels stable. Pushing the increased demand through existing California capacity will present a challenge his year.